There was once a phrase you would hear as it relates to the world of smart phones and you hear today as it relates to the world of cable: “Cutting the chord.” I last shared with you my review of the Aftershokz Bluez 2s a month ago and mentioned at the time they I was surprised that I liked the device. It was not an Aftershokz specific reason but rather my affinity for my Yurbuds. These chorded headphones had served me well since I started running and why change. But that all changed with the arrival of the Bluez 2s! ﻿As a BibRavePro, I had the priveledge of trying out another product of Aftershokz recently – the Trekz Titaniums. My initial thoughts: Outstanding! 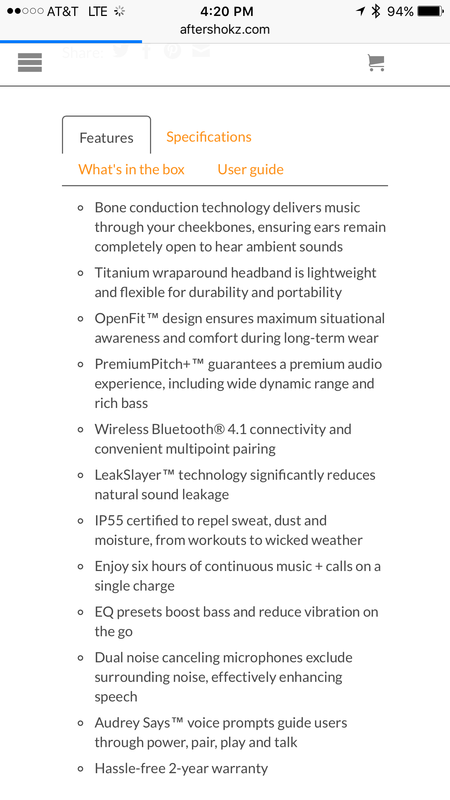 Before going into the review, let me run down the reasons that I previously favored the chorded “Yurbuds” versus wireless headphones. The Aftershokz products I have used his far, solve these problems and some! Before going into my review of the Trekz Titaniums, here is the detail of the product from their website. Now, let’s take a look at the Pros and Cons of the Trekz Titaniums. Good Sound! 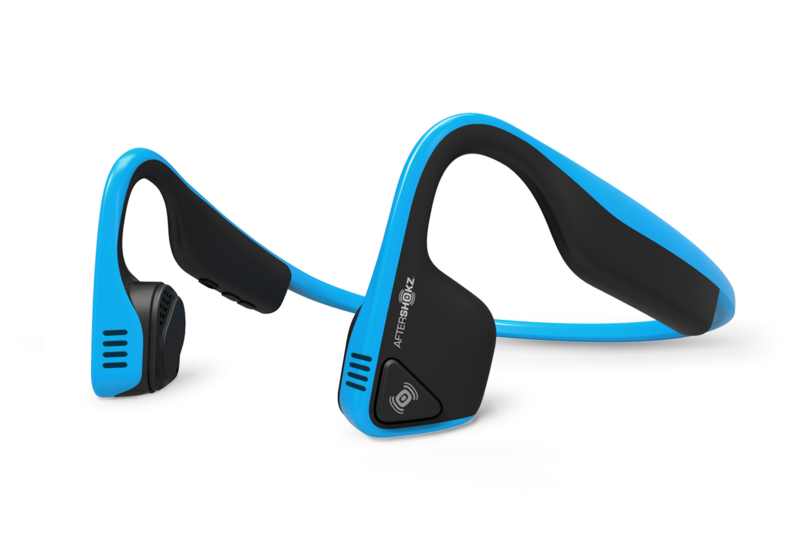 I was skeptical of this “jaw bone tech” before using the Bluez2 but after using them, that skeptism vanished! Now taking this to the next level, I think the sound is slightly better with the Trekz and crystal clear. Even in the loudest of traffic, I still hear most of sounds (even quiet books from audible). This allows me to maintain focus on my run and at the same time, remain safe (as I hear cars or bikes coming up behind me in the city and other places I run). Also, the Bluetooth connection appears to be stronger as the breakups that I experienced in the sound have not occurred! Comfortable around the ears: This device is rock solid around the ears. No matter how much I sweat or shake for that matter, they do not budge. And with their position (i.e. not in the ear), there is no sliding of the ear pieces (like in ear headphones) that leads to a change in sound quality. They are also very light and I forgot they were on recently as I could barely feel them. Yet, they stay in place! Lightweight: Like the Bluez 2, the Trekz are lightweight (which led to the aforementioned issue of forgetting they were in my head). I like that feature very much as I don’t like anything that provides a drag while running! Easy control of sounds via device: Sound control is easy. To turn something on or off, just press the button on the ear piece. It seems to have a delay (though less so than the Bluez2) which probably is all about the Bluetooth connection and my quirky iPhone! Safety First! The jawbone technology has been a lifesaver for me – literally. A few weeks back, I heard a car coming up behind me and was able to adjust accordingly. Before that though, the same thing happened while wearing in ear yurbuds and I had NO IDEA the car was coming up behind me. This difference is super important and I would imagine to others as well. This is worth the consideration alone! Battery not long lasting: Now, as I mentioned in the previous review, for whatever reason, I have unreasonable expectations for any device and battery power so this is probably more of a bias of mine than anything. The Bluesz 2 headphones give me six hours easily of time but overnight, if not plugged in, lose power. The Trekz on the other hand, have a longer lasting battery! I can go two days without charging (but without using). That still seems too low to me but is an improvement. Volume hard to navigate and power plug “tough” to manage: This is not an big issue but I found the placement of the volume button in a tough place near the power button, like the Bluez 2s. Not a big issue because I can control volume via my iPhone but if I am keeping the phone in a belt, it becomes more difficult to turn the volume up and down. As for the power button, the plug is a struggle in and out of the slot though slightly better than the Bluez. Storage better but…: So the Trekz come with a case that does protect the device better than the Bluez. But it does still worry me they if something heavier than my shoes, might do some damage to them in the bag. Small problem but one nonetheless. THE VERDICT: A- : I am a big fan of these. They are a major step up from other wireless and wired options that are on the market! Yes, I still like my Yurbuds but being wireless has hair changed my running. This I am sold on the Trekz Titaniums from Aftershokz! Previous Post Raving about Handhelds! Next Post 5 for Friday: Getting Ready to Tackle the Hat! Pingback: What is a BibRavePro? – BMac Running the World!